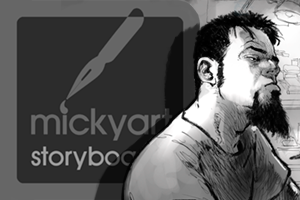 A big chunk of my work is to draw storyboards. Most of the work I do in this field is for advertising agencies so, that means I'm used to have tight deadlines. The other side of my work is comics and I've been doing them since as long as I can remember... my first comic strip was done while I was 7 years old during a blackout with only a candle for light source! I'm from Portugal, living and working in Lisbon. My real name is Jorge Macedo but I'm known by the name of Micky since highschool, it's how I sign my art works and it's how I like to be credited as.